AHF All hardwood floor ltd Vancouver based Hardwood floor resurfacing Traditional supply installation repair of Varnished real hardwood floor and stairs Craftsmanship since 1979. 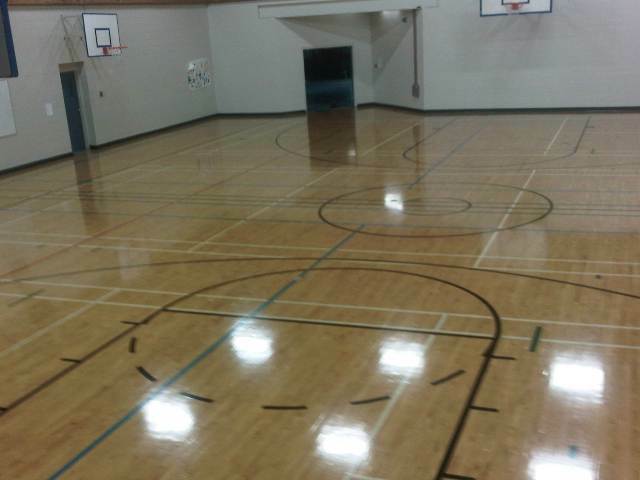 Professional Artisan of GYM Gymnasium basketball floor re sanding and finishing repairs and ball puck stick game court markings and painting serving Vancouver, British Columbia. Ken Moersch Skill level Eleven. Specialty working with dangerous floor coatings. AHF All Hardwood Floor ltd Gymnasium hardwood floor refinishing. Master craftsman hardwood floor layer floor sander finisher of 35 years of expertise willing to do the work on your floors. 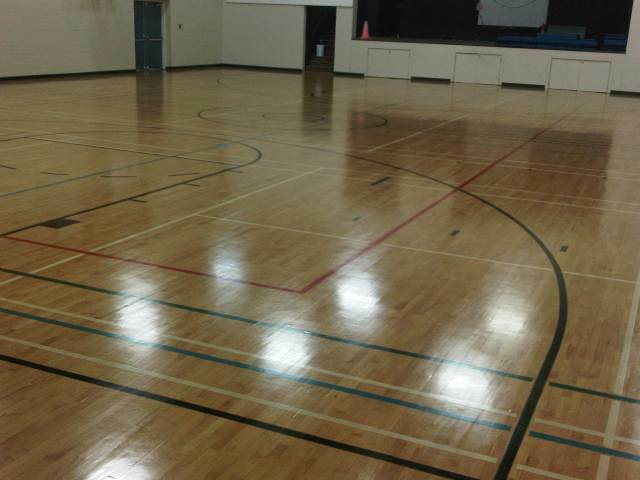 AHF-Allhardwoodfloor Ltd offers the BCH RJC as our premium Moisture Cured urethane gymnasium hardwood floor coating. 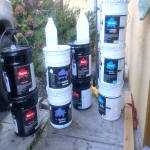 This is an extra tough gloss solvent based Industrial strength floor coating is ideal for surfaces needing to be neither sticky or slippery but somewhere in between for high performance high school university and professional basket ball, volley ball, badminton floor hockey, hand ball racquetball, pickle ball, shuffleboard, four square, Awana and other such sports played indoors on maple and beach hardwood floors. Ideal protection for artwork and graphics like a team emblem or logo painted on a Gymnasium floor these large gallery and theatre or ball room and recreation centre floors can benefit greatly from the protection of this extremely durable floor finish coating. This product will last on a high school gymnasium maple sprung hardwood floor with two thousand children for at least four years and often seven years ,This BCH RJC Product is excellent with two component polyamide epoxy paints and urethane alkyd enamel paints and our special SFC epoxy paints. 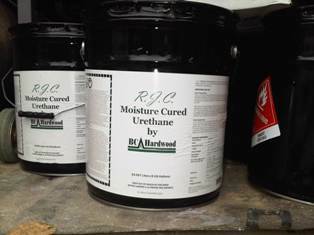 Moisture cured urethane is a classified as a LOW VOC (volatile organic compound) floor coating however this is professional use only and the smell is very strong needing several days to air out before reusing the building. Standard cure is about two weeks. This is AHF's premium top quality gym floor coating BCH RJC. Industry standard Work Safe BC compliant Hardwood floor sanding utilizing High Quality American Made Hardwood Floor sanding Machines and Matching Dust collection containment systems are perfect for all hardwood locations for on site sanded wood flooring......AHF All hardwood floor ltd has a great advantage with our Cadillac's sanding machines the American Twelve floor sander machine, Simply put the best twelve inch floor sander machine ever made. In the case of a stained colored wood floor followed by an American Floor crafter eight inch Belt Machine the best eight inch belt machine ever made. Read more on the sanding preparation! AHF-All hardwood floor ltd this example is Street Shoe a Basic Coatings finish used as protection on this elementary schools gymnasium floor with a regular screening and recoat with two coats every second year keeping in mind that elementary sized players are using this floor not the beer league! Please be aware of the following! Not a good choice for top nailed strip hardwood flooring after the second time around. Water based hardwood floor finishing is usually fairly harmless. Due to the low cool gassing off process there is very low strength odors making It is usually possible to sleep in your home each evening. Heat and light: The home or dwelling must be heated and light well. Airflow: In order to ensure the maximum paint shop out come must have control of airflow, ventilation, foot traffic ext. Pick an appointment when there is nothing else going on if possible. Excavators working on the roadways causes vibrations in turn cause dust to flow. Painters or roofers working outside can also interfere with getting quality finishing results. Pilot lights and gas may be shut down if necessary. 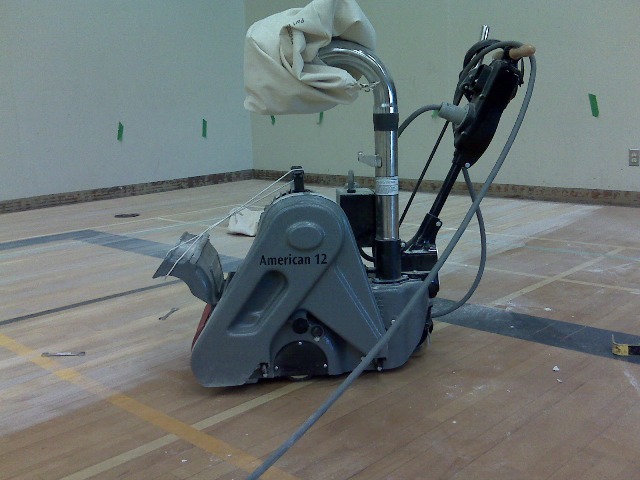 Gymnasium floor sander rider setup requires a single 90 ampere 3 phase breaker. These types of professional dust containment hardwood floor sanding machines are not available as a rental tool, that is an easy 8 by Clarke its 110 volt job. weighs about 100 lbs. Same thing the edger sander is the more crucial element, the rental shop have a rental version that turns 400 times/minute slower than the B2 Pro. American Clarke twelve inch sander machine is 7.5 horsepower 230 voltage and 320lbs. Called the Cadillac of the flooring industry, the hundred something year old patent still rated the Number 1 hardwood sanding machine in the world. AHF All Hardwood floor ltd. is celebrating its Fifteenth Birthday. Incorporated in April 20th 2004 in Rainy Vancouver BC. Still offering its original business plan of only selling top quality real solid wood species of hardwood flooring and stairs traditional wooden flooring that is sanded on site by hardwood floor refinishers of top quality certified recognized to be the highest standard leaving the cleanest jobsites for our wooden floored residential customers. Ken chooses to use floor coating products known as Glitsa™ Gold Seal Swedish Varnish and a few selected water borne floor coatings carefully guiding clients to the best value beauty and durability. Ken Moersch is the sole owner of AHF All hardwood Floor Ltd Ken also does the work so its no secret all the work that has been displayed on the internet is all hardwood wood floors floors, A wood flooring company Offering all types and styles of hardwood flooring services. Established 2004 AHF All hardwood floors ltd continues to exceed customers expectations with consistent reliable exceptional high quality amazing results completed on time with diligent punctual customer services. Versatile dependable hardwood flooring master craftsman is talented, crafty and knows magicians tricks of the trade. Specialties such as staining wooden floors a dark brown color, painting basket ball game court markings and a centre logo on a gymnasium floor or building a set of stairs in your home. Local Vancouver British Columbia area professional hardwood flooring resurfacing and repair services gymnasium floor refinishing a specialty floor coatings contractor available areas served include : North Vancouver, Port Moody, Coquitlam, Port Coquitlam, New Westminster, Burnaby, Maple Ridge, South Vancouver East Vancouver West Vancouver, Langley, Chilliwack, Cloverdale, Richmond, Surrey, White Rock, Crescent beach. Whistler, Squamish. Pemberton. Out of town inquiries Welcome!